We will be going back to our Order Form in this class. We'll begin by setting the whole order as LOCKED as soon as it's marked PAID. This way no further changes can be made to it. Next we'll set up a REFUND button so that someone can take a paid order and mark it NOT paid, but at least its a separate step (and you can optionally put a password on it). 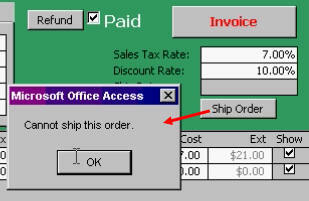 Next we'll add a ShipDate field and "Ship Order" button to the invoice. 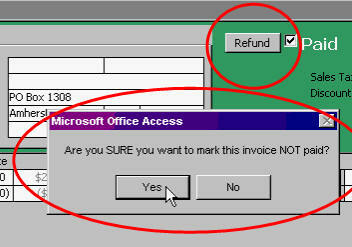 Click on the button, and the invoice will be marked SHIPPED. Next we're going to start tracking inventory levels. 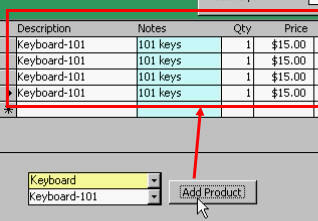 We'll add a Quantity On Hand field to our product table and form. We'll add a note in our System Log any time a user changes an inventory level so we can see EXACTLY where our products are going. Next we'll examine a problem we have where if we add the same product multiple times, we get multiple line item entries in the order. 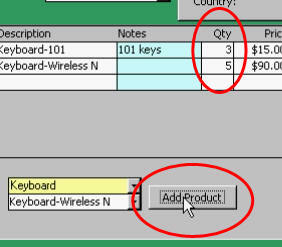 We'll write some VBA code so that if you click on Add Product multiple times for the same product, it just increments the Quantity field. This is a much nicer result. Next we'll start working on the process of shipping an order. First, we'll check stock levels. If we can't ship an order because we don't have enough inventory, the database will yell at you. Now we'll write the code to actually remove the items from inventory once they're shipped. This all happens behind the scenes, but it updates your product table. T-Bone on 8/31/2009: I will need to know how to do a partial shipment when there is only 2 in stock but customer needs 5 of that product. Richard Rost on 8/31/2009: A little later in Access 329 we'll cover creating Purchase Orders. I'll show a technique for receiving only partial shipments from vendors. The same technique can be applied to making partial shipments to your customers. Ray McCain on 10/2/2009: The user logon will work properly as a separate database. When I import it into Access 326, I have a problem. When the user name and password are both used, there is a type mismatch error. The user name and password are being read correctly, but then treated as though the username was null. The following statement turns yellow when the debug runs Set rs = db.OpenRecordset("Select * from UserT where Username='" & UserName & "' and Password='" & Password & "'"). How can this statement work properly in one database, and then not work when it is imported? Richard Rost on 10/4/2009: Ray, the only thing I can think of is that you have a REFERENCE error. Do you have DAO listed in the references BEFORE ADO? Aside from that, I don't know what it could be. Ray McCain on 10/5/2009: At your suggestion, I checked the references. I did not have ADO objects library check and only had DAO library checked. I did find that Active X data object 2.1 library was listed before DAO 3.6 object library. I removed the active X data object library and then added it back. This put it in an order after the DAO object library. With that change, everything in the LogonF works property. I was using the after 326 folder that I created from the student folder, and it came with the reference librars as shown above. I am surprised that I am the only one to come up with a problem. Ron on 1/13/2010: hi - Ray's problem happens to me sometimes too. Access thinks that the username is null. I can't figure out why it happens sometimes and not other times. I try to display the username with a messagebox and it shows nothing. Maybe it has something to do with importing the stuff from one database to another? It happens to me in Access 2007. My name is Sopheak. I am a new beginner of access programming. Please do not mind me if I ask you with a wrong question. My idea I just want you to show and help me how to use MS access VBA like accounting system: General Ledger, T-Account DR/CR, Balance sheet, Income statement or cash flow, and inventory with invoice sale/purchase, SO or PO and a very special need for me is REPORT summary and detail like for inventory report filter by from DATE and to DATE(beginning Stock(Qty) with value, Purchase stock(Qty) with value, Sold stock(Qty) with value, and Ending stock(Qty) with value.... and more). I hope you will smile before writing to me and I strongly do hope you can surely help with this question. Please please please tell me if you don't hesitate to show me your kindness. I love your PRODUCTS. From me, Sopheak (Asian People). Bye Bye. God bless your business. Thanks. Would it be fairly easy to use set up code to log any changes made to specific inventory numbers? eg. shipping, purchase order reciepts, manual adjustments, etc. Basically the same type code used on a user level but attached to inventory items instead? I am thinking it would be good info for tracking variances and how they happened. Thanks as always for your great classes. Probably the easiest thing to do would be to create a ModifiedDate field in your table. 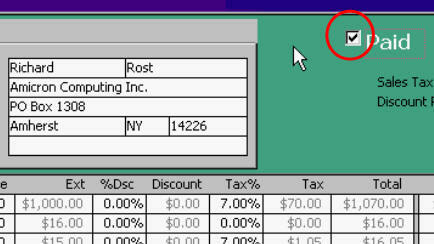 Whenever a record is changed or added, set the ModifiedDate. This way you could go through and look at all of the recently updated records. Richard Lanoue on 9/8/2014: on Course 326 Lesson 6, yes I would like to see partial orders system. Robert Whishaw on 12/17/2015: Due to the fact that the form is locked when an item is paid how can we exclude the "Ship Order" button from becoming locked? I don't know how/why your ship order button didn't get locked down like everything else.